Maybe it's because I'm Belgian and grew up with the Graeffe brown sugar, but I've always found it superior to the hard/crystalline brown sugar you find in stores in the US. Is there a brand close to the Graeffe one that comes close or do I have to order it from Europe? Here you can find a picture of said sugar (on the left; the right is granulated sugar, for comparison). Normal cassonade is cane or candy sugar with added molasses (I don't know what the exact difference is with brown sugar, I think cassonade is just a type of brown sugar. ), however this cassonade is from sugar beets. My best guess to replicate it is to put some regular granulated sugar for a couple of seconds in a blender, so the size of the particles is smaller. Then add some molasses and if you can find it, a drop of inverted sugar syrup. 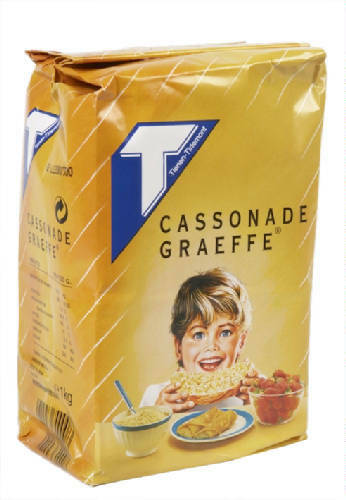 I've also found that there is caramel added in Cassonade Graeffe, but I don't know whether they add that flavour or they caramelize the sugar for a short amount of time. If I find the time, I will try to find out more, but it's not a product with a lot of information about. If you just want a close alternative, I would advise you to just buy different kinds of brands of brown sugar. Perhaps, one will be softer than the other (I don't live in the US, I can't speak to that). Try to find brown sugar from beets, not from cane sugar (not sure if this is available). Or if you're willing to pay the taxes and shipping costs, I can send you a package. It sounds a little like demerara sugar which is softer than some.